Jackpot 6000 is a classic slot with a twist, which makes it a great game for fans of classic slots and video slots alike. The game uses traditional game symbols of cherries, bells, lemons, grapes and the star, as well as the funny jester. This game gives an authentic feeling of being in a land-based casino, and you can enjoy a fast-paced an energetic game-play with a thrilling heads or tails feature and the Supermeter mode for the highest jackpot of 6000 coins! The game has a relatively high volatility, and there will be many game rounds where you won't win anything. The return to player varies with how you play the game. For bets of 1 to 8 coins it is 74.9% - 79.2%, and for the maximum bet of 10 coins and the Supermeter mode it is 95.1% - 98.9%. This means that you really should play the game with 10 coins per spin, as it is not really worth it otherwise. You can also play Jackpot 6000 on mobile devices, as the game has been optimised for iOS and Android devices. 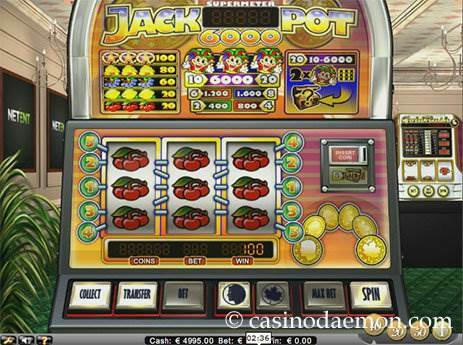 You can play Jackpot 6000 for free here and see if you like the game. You can play it for real money at one of the online casinos mentioned on this page. Once you get a winning combination the heads or tails feature activates, and you get the chance to play the win in a double or nothing game. You can also click on spin, and the win is transferred over to the Supermeter, which is shown above the reels. Each spin costs 20 credits, and you get the chance to win a mystery win of between 10 and 6000 coins when you get 2 jesters anywhere on the reels, or you get the maximum jackpot of 6000 coins when you get all 3 jesters on a pay-line. The Jackpot 6000 slot has 3 reels with 5 pay-lines, and you can select a coin value of either 0,10, 0,20, 0,50 or 1 £/$/€ and play up to 10 coins per spin. The minimum you have to play in one round is 0.10 £/$/€ , and you can increase your bet up to 10 £/$/€.